Adlon Hotel History: Marlene Dietrich, Berlin, 1929. 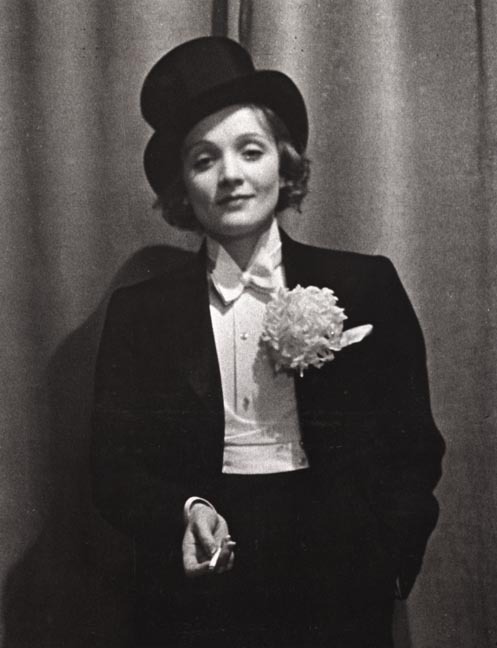 At the annual Presseball in the famous Hotel Adlon, Dietrich wore tails and pants, which was unheard of at that time. She had to stand very still because the exposure was always between half a second and a second. If someone moved I had to take the picture over again. On October 24, 1907 the Vossische Zeitung in Berlin reported: “Yesterday, His Majesty the German Emperor, Her Majesty the German Empress, the Princesses and the Princes visited the impressive building of the Hotel Adlon and paid their tribute to that site.” From this day on the history of the Hotel Adlon began taking its course – the history of a hotel which was built with the support of Emperor Wilhelm II, and which within three years would become the most beautiful and most luxurious hotel in the world. 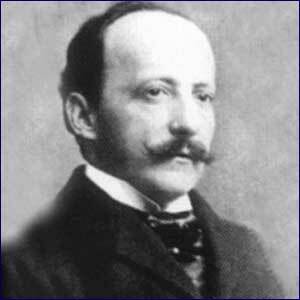 The founder of the hotel was Lorenz Adlon, the son of a shoemaker from the city of Mainz. His professional career, however, did not begin with the hotel trade. In 1872 he finished his first apprenticeship as a carpenter. His master was the well-known manufacturer Bembé, who later made the interior of the Hotel Adlon. During his apprenticeship as a carpenter, Lorenz Adlon had already begun to work in the catering business. He had his first experience catering for a large crowd in 1876, during festivities such as the Marksman Festival. By 1888 his reputation had grown to the point where he was put in charge of the catering for the World Fair of 1888 in Amsterdam. For the first time the name “Adlon” gained international recognition. Meanwhile Lorenz Adlon had moved to Berlin, where in 1880 he acquired the famous restaurant “Hiller” at 55 Unter den Linden, where now the Cafe Einstein is located. In 1885 he expanded and purchased the “Zoo-Terrassen” in the Berlin Zoo. 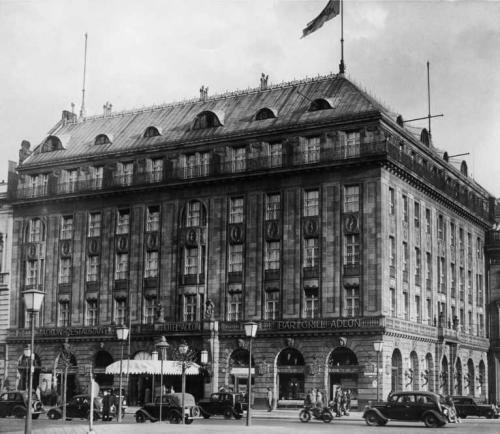 In 1889 Adlon bought his first hotel, the “Mille Colonnes” in Amsterdam, and a few months later the Hotel “Continental” in Berlin. On the occasion of the “Industrial Exhibition” in 1896 he ran the “Hauptrestaurant von Adlon und Dressel” at Lake Neuen See. The second side of Lorenz Adlon’s business was his wine trade. It was said that more than a million bottles of wine were stored in his cellars in Berlin. 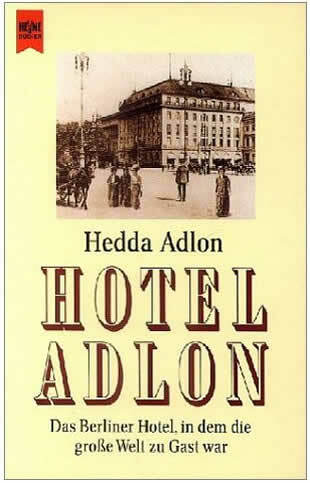 Lorenz Adlon carefully invested the profit he made from his various business ventures, and was finally able to fulfill his lifelong dream, the building of his own hotel. 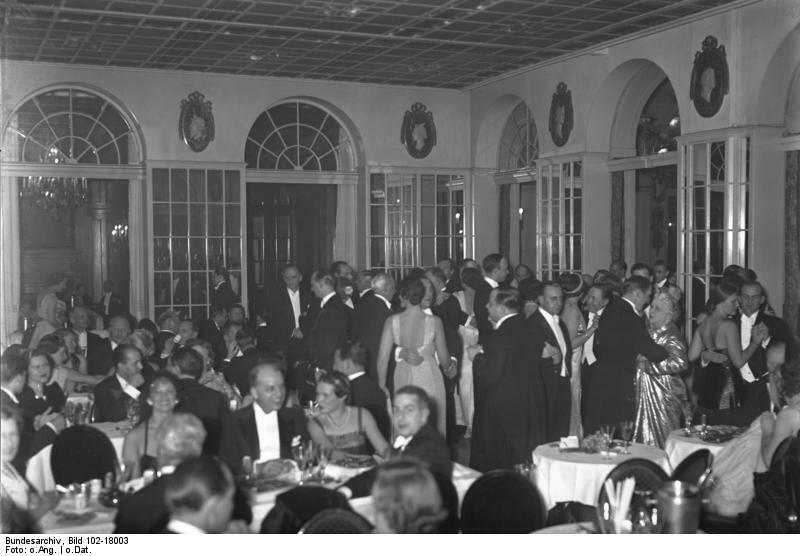 In the years of political and economic upheaval the Hotel Adlon became a location of political and diplomatic decisions. During the political welter of the pre-war period and the Third Reich, the Hotel Adlon was called “little Switzerland in Germany”. The SS preferred the Hotel Kaiserhof on Wilhelmstrasse. In 1936 the Olympic Games conferred pomp upon its “official Hotel”. Only Adolf Hitler avoided the Hotel – he only visited it once. Luckily, the Hotel managed to survive the Second World War without any extreme damage. In 1945, the rooms of the Hotel were no longer filled with luxury-seeking guests but with the moans of victims of the War, the nearly undamaged Hotel having been transformed into a military hospital. At this point, the only major noticeable scars left by the War were the walled up windows on the first floor. On the night of May 2nd, 1945 a fire tragically demolished parts of the glamorous building. Russian soldiers started it. Nevertheless, the former GDR reopened the surviving lateral wing as a hotel. Despite the socialist climate, a guest at the Hotel could still find page-boys and bellhops – dressed in the original uniforms of the Hotel. In 1964, the building was even renovated and the facade was redone. 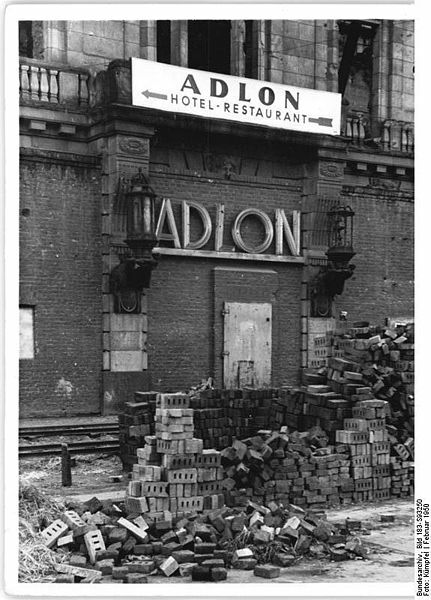 However, a decision of the 1970s closed the doors of the original Hotel Adlon forever. The most luxurious hotel of the Roaring Twenties was to become a lodging house for apprentices. In 1984 even the building itself disappeared, torn down to make way for new construction. With the reunification of Germany, the world was finally able to witness the rebirth of the grand Hotel Adlon. On August 23, 1997 the president of the Federal Republic of Germany opened the new Hotel Adlon, a Kempinski hotel, rebuilt on the same location as the original Hotel, directly opposite the Brandenburg Gate, reviving the high standards of luxury and service that had made the original Hotel so famous. 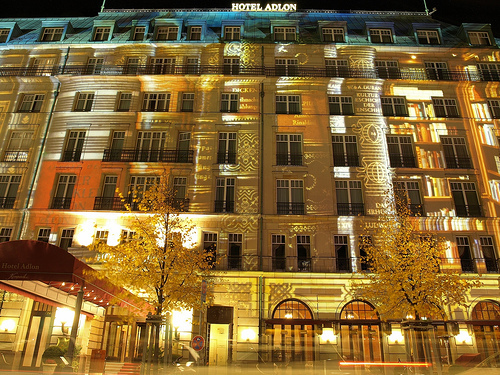 After five successful years, the Hotel Adlon is proud to present the new annex – the Adlon Palais. It is situated between the Academy of Arts and the Hotel Adlon Kempinski. The Adlon Palais is a spacious and sophisticated new building, enlarging the Hotel´s capacity for top-ranking events. The Palais will also house the exclusive members-only China Club, which is located on the top two floors and has its own roof terrace. Two years later, in May 2004, 69 rooms and suites were added on to the Hotel. In the summer of 2006, a third presidential suite was built which is integrated into the new security wing that extends over 450 sqm. There were also new developments in front of the five-star Hotel – in the summer of 2000, the terrace, with a view overlooking the Brandenburg Gate and a seating capacity of 170 persons, was opened. In July 2006, the Hotel entrance was fitted with a burgundy canopy, to prevent the guests from getting wet in rainy wheather. In December 2006, the conversion of 48 rooms into 24 suites – many of which have now private fitness rooms and a sauna – was completed, many of which have private fi tness rooms and a sauna. 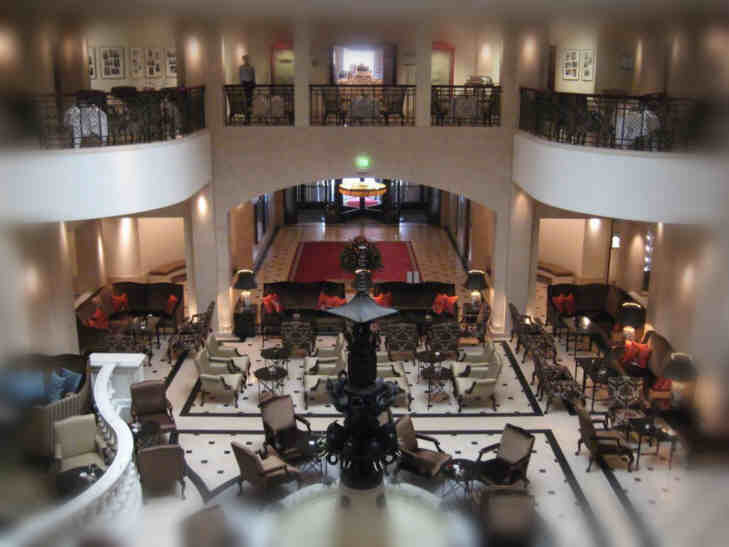 The Hotel Adlon now boasts over 382 rooms including 78 suites. In 2007, the Hotel Adlon Kempinski celebrated its 100th anniversary and, at the same time, also its 10th anniversary since its reopening in 1997 as part of the Kempinski hotel collection.